It’s less than a month until the opening event of the PCA Clubsport Series presented by Pirelli. For those who may be unfamiliar with the new series, the goal is to bring some of the fun and features of Trophy East to racers of late model factory race cars, but at a much lower price point. The 6 race championship series for drivers of GTC6, GTC7, and GTD factory Porsche race cars kicks off in April at Road Atlanta and visits some classic venues before wrapping up at Daytona in October. 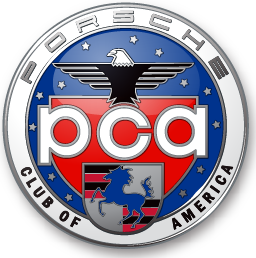 We have recruited, PCA Porscheplatz Coordinator, Lynn Friedman to be our Series Coordinator this year. If you have visited a Porscheplatz at one of the pro races, you have probably met Lynn. If you are thinking “Why would anyone who is planning to run even one of those races not sign up, get decals and gear, and have a better shot at free tires?” then you are starting to get the point. Fill out the Clubsport Series Entry Form and fire it off! The PCA Clubsport group will share the track with other drivers in the appropriate group, speed-wise. GTC cars will be in the fasted group. GTD cars will be in the fasted or second-fasted group. Points for PCA Clubsport will be the sum of regular PCA points earned in the 6 weekends, dropping your 4 worst race finishes in those 6 weekends. All PCA rules, such as weight, tires, and car configuration for the appropriate class (GTC6, GTC7, GTD), apply to the PCA Clubsport Series as well. Race weekend trophies and contingencies will be awarded based on cumulative best score for the weekend in each of the 3 classes. Season Championship awards (tires, watches, etc.) will be awarded at Daytona.